The vegetable garden suffered this year. Not only was the weather appalling but the Husband, lulled into a false sense of security by our bunny-killing machine (aka Puddy Cat), took down the rabbit-proof fence – the week before the cat up and died on us. It didn’t take long before the rabbits realised that our newly planted leeks, beans and kale were an all-you-can-eat buffet. The only things that survived were a few plants of perpetual spinach, some Swiss chard – and, thankfully, the squash. 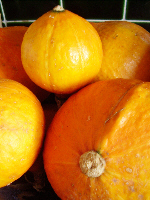 After last year’s success with the Ushiki Kuri squash we planted lots more, alongside some pumpkins. Despite the weather and fortunately ignored by the rabbits, the squash took off and we managed to gather a decent yield, most of which is hanging up around the kitchen in old onion net bags. The pumpkins – the variety was, I think, Queensland Blue from the ISSA – never really did very well and we only managed to salvage one. Still, at least there’s enough squash so that we can make winter warming soups like this one, adapted from Nigel Slater’s Bean and Black Cabbage one, especially good for killing colds if you have some good chicken stock in the freezer. Cook the onion slowly over a medium heat in some olive oil in a large soup pot. As it gets soft, add the garlic and chilli. Continue cooking for a few minutes before throwing in the chunks of squash. Stir it all around and let it cook for 5 minutes before pouring in the stock. Simmer for 15-20 minutes until the squash is soft then add the beans and shredded cabbage. Cook until the cabbage is tender – mine only took 4 or 5 minutes – then taste, season and serve in wide bowls with a scattering of parmesan and a drizzle of olive oil across the top.